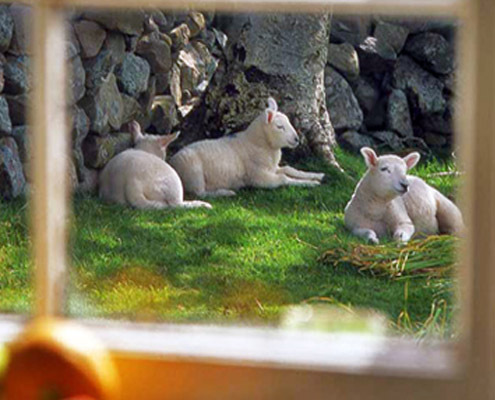 The cottage is a traditional, whitewashed croft house with a red roof and adjacent stone byres. 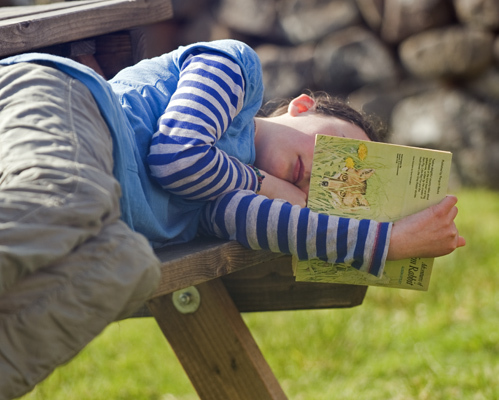 It has been owned by the Armstrong family since 1958 as a much loved holiday home which has been enjoyed by family, friends and visitors for many years. 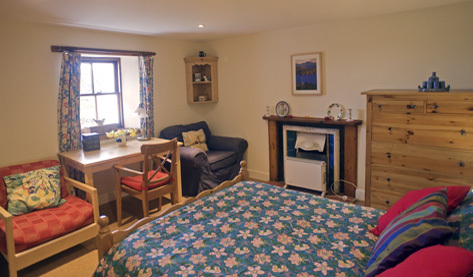 The cottage is comfortably furnished and cosy. The front door opens into a lovely wood-lined porch with large windows looking out to the stone walled garden, full of wild daffodils in springtime, and views to the mountains and sea beyond. For more information about how to book please visit our booking page. 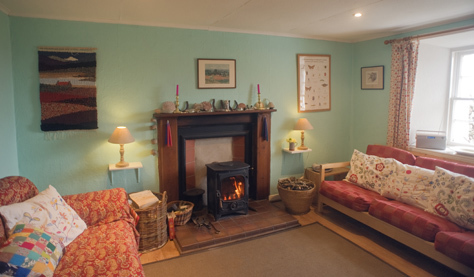 The sitting room has two sofas, a dining table and chairs and is heated by a wood-burning stove, which keeps the room cosy and warm in all weathers. Kindling and fuel are provided. 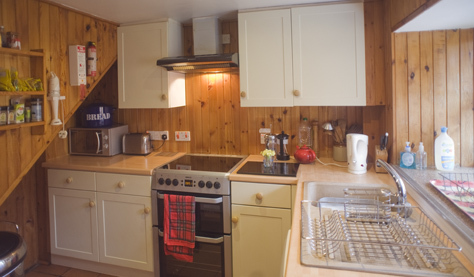 The modern kitchen is wood-lined and fully equipped with electric cooker, microwave, larder fridge, washing machine, and all necessary crockery and cooking utensils. There is also fridge-freezer located in the porch. The downstairs bedroom is a tranquil room overlooking the garden, with a double bed, two armchairs and a writing table by the window. 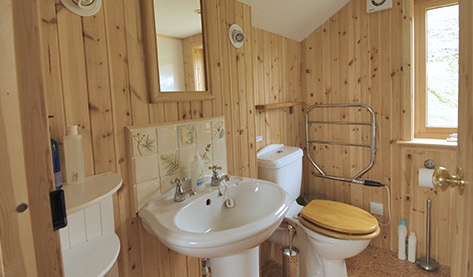 The wood-lined bathroom has a bath, shower, WC, wash basin, fan heater and heated towel rail. Designed and beautifully crafted by a local architect, the bathroom has a large window with a spectacular view to the summit of Ben Mor Coigach. 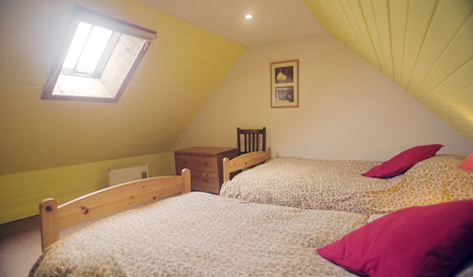 The double bedroom has a king size bed and is wood-lined, with a view from the skylight across Loch Broom to the mountains. 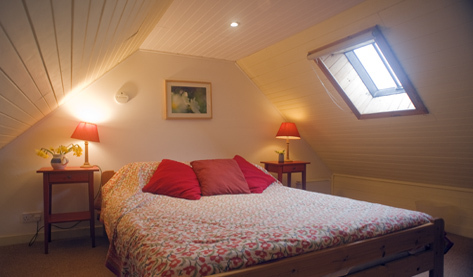 The wood-lined twin bedroom has two single beds and a skylight view overlooking the garden and sea beyond. 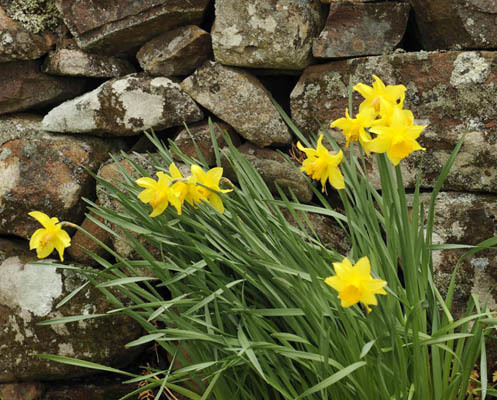 The garden is a sheltered grassy area surrounded by dry stone walls. A sturdy picnic table and garden bench are ideal for relaxing and eating outdoors in fine weather. There is ample parking space beside the house.